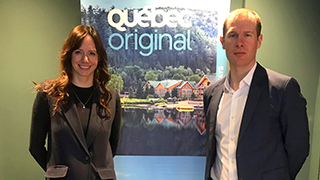 Alexandra Leclerc, Director of International Business Development and Media Relations (left) and James Allen, Manager of Business Development for the Americas with QuebecOriginal. 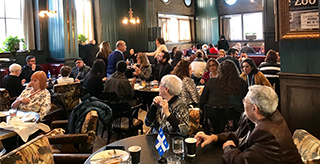 Travel agents, journalists and Quebec suppliers enjoyed breakfast at the Broadview Hotel before heading upstairs for the marketplace. 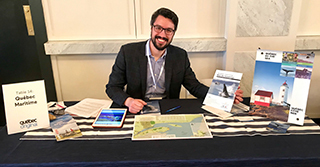 Étienne Fiola, Marketing Officer with The Quebec Maritime tourist board. The Pot à l'Eau-de-Vie Lighthouse. Credit photo: Quebec Maritime. 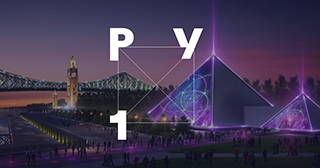 Concept photo of the PY1 pyramid-shaped event venue soon to open in Montreal's Old Port. Credit photo: PY1. Quebec is a province straddling two ways of life, from the fast-paced thrill of its festivals to the tranquil enjoyment of gazing out from a mountain peak; from lingering over a glass of cider at an apple orchard to ziplining above a tree canopy; from the pandemonium of a metropolitan city to the tranquility of rural countryside. Between all these experiences – and its distinct, multilingual cultural ambiance -- Quebec has a comprehensive tourist offering unlike anywhere else in North America. That diversity was well demonstrated by 20 suppliers from across the province at an Experience Quebec breakfast and marketplace on 26MAR. Approximately 80 travel agents were invited to discover the region and offerings from world-renowned destinations like Montreal and Mont Tremblant and lesser-known but equally intriguing places like Côte-Nord. Montreal, Quebec’s largest city, proves once again that it’s at the cutting edge of festivals and entertainment with a new exhibit launching this summer. PY1 pyramid by Cirque du Soleil founder Guy Laliberté is an immersive visual and audible experience with lasers, 360-degree projections, kinetic video aerial scenery, atmospheric special effects and spectacular lighting. As a gateway to the rest of Quebec, Montreal often acts as a starting place on a traveller’s itinerary before they move on to other parts of the province, but David Fily, Project Manager with Tourisme Montreal, stresses that the city deserves more than just a stopover of a day or two. He recommends at least four days to truly experience the city’s vivacity and happy-go-lucky vibe. Travellers who want a break from the traffic and bustle can head to Laval. As someone who lived in Montreal for 10 years, I know what you’re thinking – tourism in Laval? Since when? But this suburb, just 30 minutes from downtown Montreal, is a great place to enjoy outdoor activities in a less busy environment. While it’s Quebec’s third-largest city, Laval has a quarter of Montreal’s population in an area just slightly larger than half of Montreal. With lots of free parking and even a free bus line, accessing events and festivals like the brand new Illumi – A Dazzling World of Lightsby Cavalia or the popular U-Pick Tulip Field is easy – much easier than in its southern neighbour. A little further north, Mont-Tremblant continues to entice travellers with its year-round outdoor activities and growing accommodation offering. Several new luxury hotels are expected to come on the market in the next few years, including C Hotels, a $45 million, 92-room, five-star luxury complex. These timeless destinations give visitors a reason to return time and time again, but even with all Quebec’s notoriety, Alexandra Leclerc, Director of International Business Development and Media Relations with QuébecOriginal, says there is still a lot that people don’t know about the province. Three-quarters of all visitors to the Quebec Maritimes, for example, are Quebec locals, leaving a lot of room for discovery for the rest of Canada. Although the region has several regional airports and cruise ports, hands-on travellers can hop in a car and explore the biodiversity and plein-air adventures of the Quebec Maritimes on their own agenda. “We really are a road trip destination,” says Étienne Fiola, Marketing Officer with the region’s tourism agency. 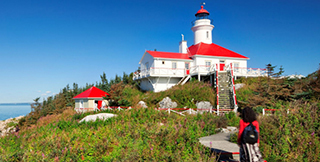 The 800-km coastal loop around the Gaspésie Peninsula is dotted with charming lighthouses, some of which have been converted into eccentric accommodations, like the Pot à l'Eau-de-Vie Lighthouse (Brandy Pot Lighthouse), which accommodates guests on an island right in the middle of the Saint Lawrence River and is only accessible by boat shuttle. On the topic of unique accommodations, birding enthusiasts can spend the night in a giant nest at a birdhouse-themed cottage in the Côte-Nord, an important resting and feeding ground for birds of a multitude of species. These adventures barely scratch the surface of what Quebec’s 20 regions offer a traveller, but even this brief highlight reel shows that the province is diverse, effervescent and QuébecOriginal. Anna is OJ's newest member and she joins the team as a writer/reporter. She co-writes the daily news and covers events. Although she's new to the industry, pursuing a career path in travel/tourism has been a goal since her first family road trip to the Florida Keys sparked a desire to discover the world and this exhilarating, fast-paced industry.